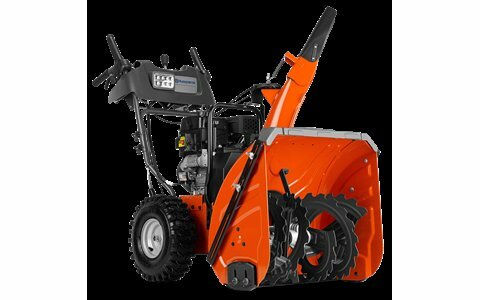 Husqvarna ST 324P has been developed for landowners who need a high-capacity, robust and durable snow thrower that comfortably clears large areas. It has been designed for frequent use in all snow conditions, 15-60 cm. The two-stage system, hydrostatic transmission and steering assist ensure easy operation. Throughout, it has heavy-duty components for maximum durability in all conditions, such as its robust auger housing, cast iron auger gear box and cast iron impeller. Features heated handle grips, LED headlight and electric starter for work in all weather conditions. Connect to a power outlet and start the engine by pressing a button. When the engine is warm, it's easy to get going with the starter handle. X-trac, heavy-tread tires for extra good traction. For merciful treatment of delicate grounds. The skid shoes are reversible for long lifetime. Auger diameter 35.5 cm / 14 "